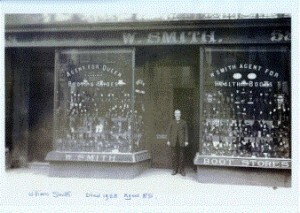 William Smith standing outside his Bath St shop. Wesleyan School, Portland Street, F Cecil Smith 3 rows back, 2nd left. 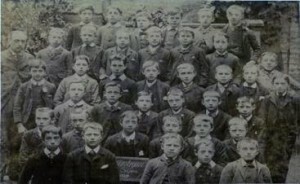 William played the organ and the boys attended the school. When the Portland Street Chapel moved to larger premises in Dale Street, William continued as organist, one of many lay positions he held in the course of his long life. He was a quiet, self-contained man. He was not active in the town’s social and political life, but was greatly respected by his fellow tradesmen. 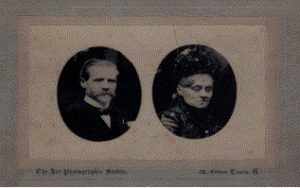 He became a director of the Leamington, Warwick and South Warwickshire Building Society, and was also the directors’ auditor for many years. William and Sarah had been married for 59 years when Sarah died in August 1928. William died about six months afterwards, at the beginning of March 1929. Dale Street Methodist Church, F Cecil Smith 4th left, back row. Frederick Cecil Smith, (1876-1949), known as Cecil, was the youngest of William and Sarah’s four sons and the one who eventually went into the family firm, running it for over 20 years. He was in turn the father of Pamela, Hugh and Christopher (known as Kit). Cecil Smith was not just a bespoke shoemaker and businessman. He served his country in the Great War, and can be seen in military uniform, in a photo graph at the Leamington Art Gallery and Museum along with is wartime driving licence. He was a good violinist and played in the 60-strong Leamington Amateur Orchestra. 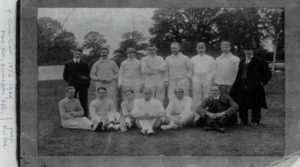 Cecil was also a more than competent cricketer, playing for several years for Leamington Cricket Club, – until he took up golf. He died in September 1949, a little over a week after falling and injuring both his shoulder and his hip, as he was cleaning the shop window. Leamington Cricket Club around the turn of last century. 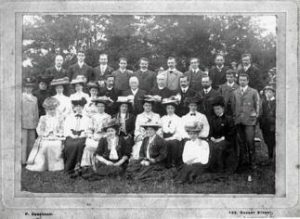 F Cecil Smith 2nd left, front row. The family home was in St Mary’s Crescent when Kit was a boy but he has vivid memories of visiting the shop in Bath Street, with Pearks’ shop at one side, and John Peel’s at the other. The shop had two showrooms, one on the ground floor and one on the floor above (for personal customers), with an engraving of Queen Victoria over the fireplace. In the back room, concealed by a curtain, were all the tools of the bespoke shoemaker’s trade: sides of leather, sewing machines and personalised wooden lasts kept on racks. Kit started school at The High School (now Kingsley School), where he won the Lower 1 form prize in 1934. When he was 9 he transferred to Warwick School, with his brother, Hugh. They cycled together to school along Myton Road, – returning home for lunch, then cycling back to school again for afternoon lessons. Warwick School then had 290 pupils, and in 1940, boys from King Edward’s School, Birmingham were evacuated to Warwick and attended Warwick School for about a year, as part-timers. They boarded in the town, – some of them were even billeted at Warwick Castle! After school, Kit trained at the Art School at Leamington, and the Birmingham School of Architecture. He then had 2 years in the Navy, before being invalided out with Tuberculosis. Kit worked as an architect from that point until retirement, first as Assistant with Helleberg & Harris in Coventry, and later in Leamington for Rayner and Fedeski, Diocesan Surveyors, who were eventually taken over by Wood, Kendrick & Williams of the Shakespeare Birthplace Trust.